BMW has a reputation as one of the finer automakers in the world. A recent win at the 2013 Telematics Update Awards for “Best Safety and Security Solution” for its improvements to its ConnectedDrive technology, BMW demonstrates once again why they're so revered. ConnectedDrive in 2014 models will come standard with powerful safety features unheard of only a few years ago, according to BMWblog.com. With an array of new abilities, the new BMWs will take driving to the next level — a level drivers should be able to test at countless dealerships in the near future. The award comes after BMW announced its decision to include AssistTM eCall along with an improved Automatic Collision Notification and Teleservice in almost every model from 2014 onward. With these additions comes a service plan of 10 years, providing constant connection to an abundance of safety and usability features. 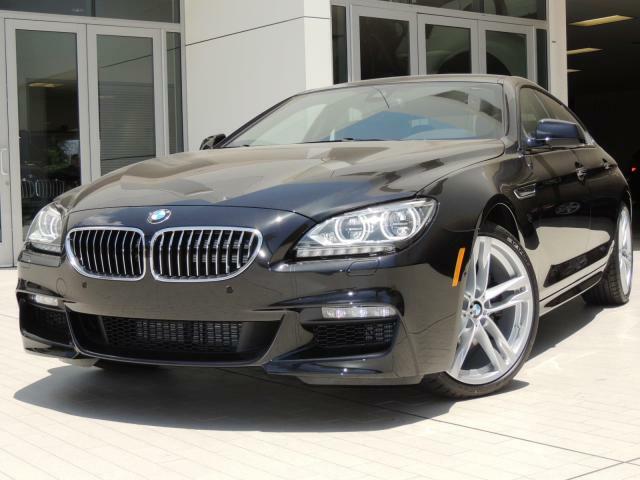 Photo of 2014 BMW 640i Gran Coupe Sedan with ConnectedDrive at Chapman BMW in Phx. Used with permission. Automatic Collision Notification communicates a range of relevant information to BMW’s call center after a collision. In the event of a crash, the system will inform BMW of the location of the vehicle, the traveling direction and specific information about the crash. Each vehicle is equipped with a number of sensors that can detect what type of accident occurred, as well as the severity of the crash. The call center receives this information immediately, and then sends out emergency crews specific to the situation. A representative will also remain on the line with the occupant of the vehicle until help arrives. Drivers can also use the emergency system manually if necessary. TeleService eliminates the need for the standard fixed intervals for vehicle service calls. Using a variety of sensors, the vehicle’s computer will notify the driver whenever service is necessary. It can even communicate automatically with the nearest BMW Service Center with pertinent information about the next service call. The new iDrive 4.2 firmware will improve the driving experience in several ways. Drivers can browse the Internet while the vehicle is stopped and will be able to use both S Voice and Apple’s Siri Eyes Free, according to EnGadget. It will also allow drivers to search Google maps using voice commands. Traffic Jam Assistant will “float along” in heavy traffic, according to BMW.com. As long as the driver keeps one hand on the wheel, the vehicle will automatically brake and accelerate, maintain a consistent distance with the vehicle in front and assist in steering as well. New models will detect the distance from the car to those vehicles in front when cruise control is engaged. The car will work to maintain a safe distance between it and other vehicles, and will accelerate and brake when necessary. When the driver drifts over the lane markers without using a turn signal, the steering wheel will vibrate in warning. Cameras on the vehicle also detect other cars in the driver’s blind spot and show a warning light when changing lanes may be unsafe. In dangerous situations, the system will take precautionary measures such as tightening belts and closing windows. These new models even detect when the behavior of the driver might indicate fatigue and will recommend the driver take a break from driving. BMW ConnectedDrive has vastly improved the safety and driving experience of the modern automobile. The driver still has control, but the car does everything possible to keep him or her safe in the process. This type of innovation demonstrates what is possible, and sets a standard for the car of the future. What Apple unveils at it Worldwide Developer Conference (WWDC) is always the topic of much speculation because it has ramifications for the rest of the tech world. Apple fans and people who experience tech-lust eagerly await the announcements for new hardware and software that come out of the annual WWDC. Since 2008, the conference has sold out completely, and this year’s sold out faster than ever. WWDC is much anticipated among developers because they get the opportunity to do hands-on tests with the latest Apple tech. The Apple Worldwide Developers Conference was held from June 10 to 14 this year. So, just what came out of this year’s conference? Read on to find out. Mac Pro: Although the current iteration of the Mac Pro came out just last year, it has been a while since Mac’s power users have seen something truly revolutionary. The new Mac Pro is a computer that looks like it’s from the future; its hardware is pretty futuristic too. The Mac Pro is built in a cylindrical shape, totally re-envisioning the traditional cooling system. It has PCI-express flash storage and new-generation Xeon processors. It also features DDR3 RAM with a bandwidth of 60 GB/s, twice as fast as the memory in the current generation of Mac Pros. Its 6 GB of dedicated VRAM ensure that graphics will be moving as fast as ever. iOS7: This is the update that will impact this most people, thanks to the ubiquity of iPhones. Announced during the keynote speech, iOS7 has a number of features that are sure to make the lives of iPhone users much simpler. Its Control Center provides ready access to critical features like the Wi-Fi and brightness settings. Notification Center is introducing “dismiss once, dismiss everywhere,” which lets notifications (and their dismissal) sync between multiple devices. Among other features, Siri has received an update. It is now possible to select a male or female voice and Siri has a more natural speech pattern. iTunes Radio: Announced in conjunction with iOS7, iTunes radio is the next step in the evolution of iTunes. iTunes radio takes a cue from services like Spotify and Pandora, allowing users to stream music for free and curate their own stations. This is significant because the original iTunes revolutionized how people purchase, discover, and consume music. The new iTunes Radio may do the same for streaming music services. iWork for iCloud: File under “cloud-related trends,” the new iWork update brings Apple’s productivity suite to the cloud. This is essentially Apple’s answer to Google Docs, but it does show a move by Apple to take advantage of contemporary web technologies—like streaming and the cloud—to improve upon existing products. iWork for iCloud lets users seamlessly create and sync documents, spreadsheets, and presentations. MacBook Air: The new MacBook makes this line of products better than ever. The MacBook air boasts all-day battery life as well as a new ultra-thin, ultra-light design. The longer lasting battery life is due to Intel’s “Haswell” CPU, which uses less power. The MacBook Air comes in 11-inch and 13-inch models. It starts at $999. Mac OS X Mavericks: Finally out of feline species, Apple has decided to name its next round of operating systems after places in California. The new OS X Mavericks is named for a surfing destination famous for huge waves. The new operating system promises to deliver more power and better performance. The demos showcased smooth scrolling, tabbed finder windows, and file tagging. OS X Mavericks also includes a faster version of the Safari Web browser. Although the Developer’s Conference is over, the life cycles of these new products are just beginning. These products promise to bring Apple in step with contemporary web technologies as well as offer some classic Apple-style innovation. John Gower is a writer for NerdWallet, a personal finance website dedicated to helping techies save money with financial tips on everything from marketing strategies to the best savings accounts. Having a direct connection to customers through your business Web site in today's digital world enhances your company’s online experience for current and potential customers. 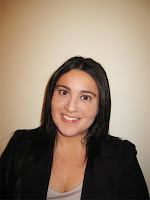 The ability of a visitor to the site to be able to chat live with a person who works for the company is often a critical element for customer service in an e commerce experience, as it bridges that divide between a physical location with employees and a convenient and efficient online experience. Beyond answering questions about products or services, the live chat feature also allows the business to interface with their customers directly. This adds to the overall experience of working with the company, according to informly. Any opportunity for a company to be helpful to people who might buy their products or give them money for their services is good. Customers love live chat because it helps improve the relationship between the business and customer. 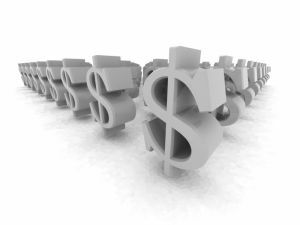 It reduces overall costs, as well as most notably in email questions to the business. This saves the company time and money answering all those questions, when a dedicated chat specialist could be doing it throughout the day. This also plays greatly into customer service, as people won’t have to sit on the phone and wait to get a simple question answered. According to a study by BoldChat, the average live chat visitor gets their question answered immediately, saving everyone a tremendous amount of time and stress. The only customers who become disillusioned with a company they have purchased something from or are working with on a regular basis are those who don’t use the live chat or have a problem that is so daunting, it can’t be solved via that form of communication. But since companies that have the live chat feature on their sites have freed up phone lines, live chat makes it easier to get a customer service representative on the phone. Live chat is easy to set up. There are a number of convenient and cost-effective live chat tools that can be installed on a company’s Web site. LiveChat.com is a favorite of small businesses, according to openforum.com, since it gives employees the ability to see what people on those sites are looking at and engage in conversations with them. SnapEngage is a live chat application that is also useful for small businesses, since it allows customers to ask questions by chatting on mobile devices. LivePerson is a live chat service that has both marketing abilities and customer service features all in one, an ideal option for companies looking to integrate marketing efforts in their chat tool. Besides pop-up boxes, adding chat to your Web site could include creating a whole new landing page dedicated to a chatroom to discuss your products or blogs, such as Chatwing. A live chat feature on a business Web site is almost as important as having a shopping cart or contact information, as it improves your customers' entire experiences and saves the company time answering questions in the future. While it’s an added overhead cost to the business itself, with implementation that includes proper training and relationship-building skills, return on investment is high. Guidance is necessary in every step of your life especially when you’re doing things over the web, such as requesting online assistance or doing anything else that requires certain steps to be followed in known manner. Without proper guidance or a tutorial, you’re challenged to do things correctly and may face a higher probability of unsuccessful or failed attempts. To make your web experience smooth and trouble free, an online web service exists called WalkMe that provides a detailed and step-by-step guide to accomplishing online goals or tasks, regardless how much it is difficult or complex, or how crucial the challenges are. WalkMe serves as an online step-by-step guidance service targeted to business owners, handling their various sorts of online business needs like online support, employee training, onboarding SaaS, or friendly UX. This online tool works as a java script code that is placed in your website head tag, providing dynamic functionality to your web pages such as adding tip balloons, text, numbers etc. over the screen. All you need is any latest version of Firefox browser (add-on is created only for Firefox, sorry) however visitors from almost any browsers can see the WalkMe balloons and step by step guide. Later then, download and open the said tool editor on the Firefox window and sign in using registered username and passwords. Open the desired website that you want to create Walk-Thrus for, customize it as per your business process needs and paste the generated snippet on the HTML page. Publish it and now your website is ready to provide Walk-Thrus to your website users. For detailed guide, you can refer to WalkMe implementation training resource. WalkMe for Online Support Businesses? WalkMe plays a crucial role in the field of online support businesses where a bunch of queries or support requests come in on a daily basis. This online guidance service will create a Do-It-Yourself (DIY) guide through which your website visitors can have clear view about what to do, how to do it right and accomplish any desired goals. Once the WalkMe code is placed on your website, you have the capability to create interactive bubbles or balloon type icons and place it where necessary. 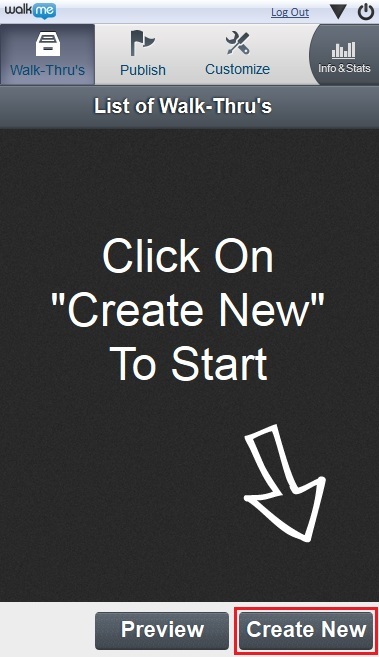 This will help customers to easily see or find what they want as well as step by step guide to accomplish that goal. There are few incoming support requests which results in a reduced workload for handling customer queries or online complaints and thus lowering your overall expanses. Complex free environment to lower service costs. Customers won’t have to have background knowledge. For example, they just landed on your website or online application and find all the instructions needed to achieve their desired tasks. Easy to implement in almost any kind of complex support environment. WalkMe provides a well-structured online step-by-step tutorial for varying needs of your business. You can request a demo of WalkMe and test it in live environment. Once satisfied, can choose any of the packages available as per your convenience. A modern call center needs investment in the latest technology. An invaluable tool in this regard is represented by computer telephony integrated with screen pop-up technology, which generates relevant information to the agents, and thus reduces the average AHT level. This way, customers' satisfaction is enhanced too, as the client does not have to answer so many questions which he identifies as repetitive. A permanent monitoring of customer service activities (historical graphic evaluation) can lead to a major solutions improvement. By taking all measures to make client interaction transparent, you can easily come up with new ideas regarding how to make things better, faster and smoother, and how to correct any problems which seem to be creating real difficulties. Outsourcing represents the best alternative for increasing a business's capital and optimizing its resources without the need for huge investments. It is also an economic resource for customer service, which guarantees value-added for any business service. However, it's imperative for the supplier you choose to be highly certified and leading in his niche for increased competitiveness. A top customer service division can approach the needs of the customers at any time, and not just those of the company. To remain in a leading market position you must be able to outcome consumers' expectations everytime. Note that sometimes it takes ten or twelve positive experiences only to outset a negative one. 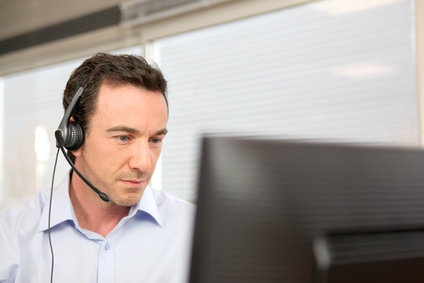 Call centers represent the most vulnerable channel of customer loyalty that can generate cost and profit efficiency. The clever corporate sector is already testing out programs like Voice of the Customer (VOC). In addition, one can easily resort to analytics for finding out which the consumer's expectations are. To lock money in hardware in a collapsed economy implies a high risk. Not only that you risk losing profits, but you also have a high chance of disappointing your customers and employees. Therefore, you have to select the ownership type of costs in order to keep up with the competition and remain on the safe side. Bringing a new customer will cost you up to five times more than retaining an existing customer loyal, so investments in modern technology represents the best choice you can make. In this regard you have to think outside the call center, and consider channels such as social media and online support tools. For instance, a live chat support and an extended FAQ base will greatly increase your chances of making a sale. Self-service is also a must given the increased competition nowadays, and in this regard you have to lead the users to discovering the answers to their questions by themselves. In this regard, step-by-step online guidance systems such as WalkMe can represent a great asset. In the current context, outsourcing has become the best decision for business growth, providing a low cost to management jobs, reduced costs, more productive employees, more experienced management and better control of the data. Additionally, it's imperative to take advantage of the latest technologies if you want to adapt to a market that's continously evolving. Ever lost access to your system due to forgetting administrator passwords or logon is disabled in your system somehow? Simply reinstalling Windows might be the easiest solution available however involves risk of losing your data permanently. You’ll feel good to know that there are few alternatives available that could help you to reset administrator or local user passwords without installing Windows and altering your precious files. Note: This tool will not recover your previously set password; instead it’ll delete all the currently stored passwords and resets it so could you access your locked or inaccessible system. The software comes in a simple executable file and requires you to follow simple steps to get it installed on your PC. Remember, you’ll need to remove the hard drive containing locked OS, connect it externally to another PC and install the application there. Alternatively, Active password changer also comes with MS DOS functionality to reset passwords without logging on to Windows. The software constitutes simple GUI and wizard based method to make your password recovery process a lot easier. The software needs to find the Microsoft security accounts manager database (SAM), a database file where information about the local users, their rights and passwords is stored. It may possible that several SAM databases were found where you need to find the exact one. After selecting a disk partition, you could see the existing user accounts listed in a specific color icon. You can choose any specific accounts with lost password or with disabled functionality and click Next to proceed to reset it. You can also choose to disable account, lock it or prevent certain users to log in at certain hours of certain days. 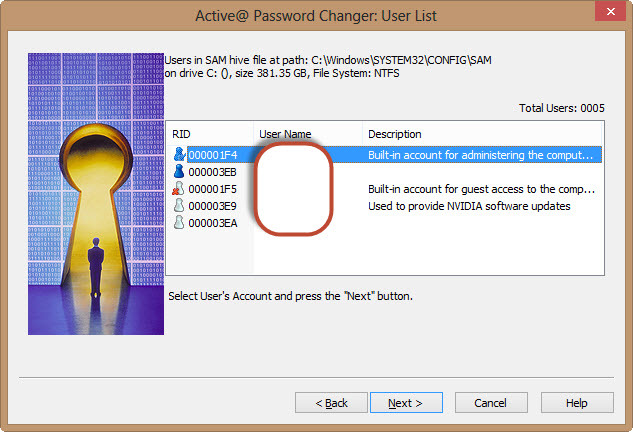 Active Password Changer is pretty simple utility to reset password, in case you forget or lose it. The software also support WinPE environment to reset password on system with only single user. You’ll be facilitated with all the image files, bootable USB or CD creator to make the password recovery process easier. You should have good understanding about SAM to know exactly how password resetting will done on system with multiple user. 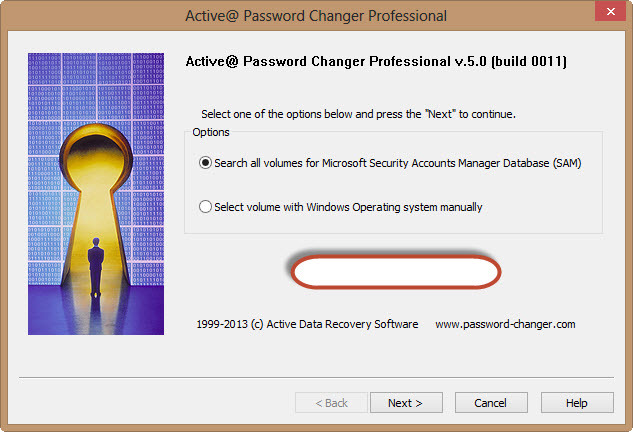 Active @ Password Changer is only one of its kinds that provide easier way to reset Windows passwords without installing a fresh copy of Windows. The software costs you around $49.95 which is quite competitive and worth having. Loosing data from your computer would be the most tragic moment, you’ve ever face. Recovering data from various data loss situations is a daunting task and time consuming process. Moreover, sometime Windows runs into problem and the partition, full of your precious files were become inaccessible or damaged. Luckily, there are few powerful recovery programs available that can successfully address various data loss circumstances. These recovery programs were specially created to carefully recover partitions or the stored data without modifying or damaging its quality. Hetman partition recovery is among one of them, highly recommended in cases if you've lost your important partition (s) or permanently deleted (shift + delete) the hard drive data. This tool provides explorer based DIY (do-it-yourself) interface to perform flawless recovery operation on any Windows based PC. Hetman tool also comes with set of powerful disk repairing utility to rebuild or repair damaged partitions, fix file system errors and make your inaccessible hard drive to work again. It supports list of storage devices including internal or external hard drive, removable media, flash chip based storage devices such as memory card or SD card and much more. You can install this tool to perform smoothest recovery on latest Windows operating system like Win8, Win7, Vista, WinXP etc. for both 32-bit and 64-bit operating system. The software efficiently salvage data from the various file systems including FAT16, FAT32, NTFS 3,4,5 and 6. 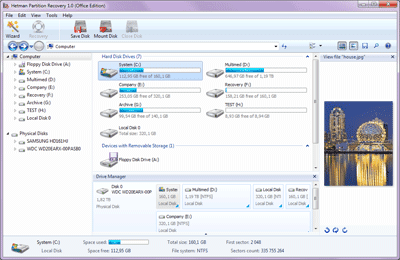 Moreover, encrypted or compressed version of NTFS system data can also be easily recovered. Later then, you can save the recovered files to an FTP server or burn it into CD DVD or save it to any external storage device location. Download and install Hetman partition recovery on any latest Windows PC exactly in the way, you install any other Windows programs. This will roughly take not more than 2 minutes. Once the program is successfully installed, double click on the icon created at the desktop screen and navigate to All Programs menu and find the executable file to start this program. At the very first screen, you could see explorer like drives hierarchy where all the currently attached storage devices were listed, either internal or external. 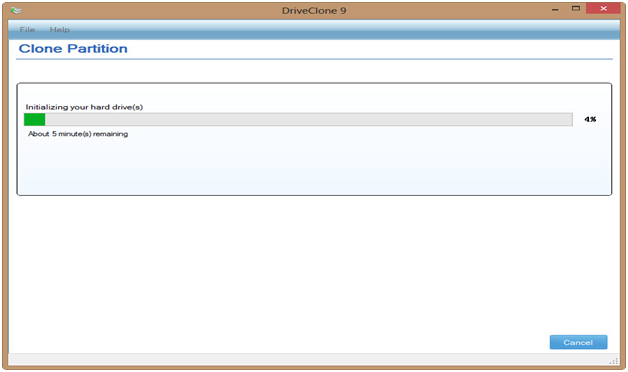 Choose the desired drive containing your lost or deleted files. Choose fast scan option of this software instead of Full Analysis to restore recently deleted files from the problem volume. Full analysis will perform thorough check to unerase data from the local partitions or attached removable media. It's a more time taking process than the previous method but suitable for effective and bit by bit scanning of the problem media. P.S. To recover lost or damaged partitions, choose the physical disks located at the left side of the software interface and perform full scan. Once the scanning process is completed, you could explore the contents of the targeted drive as usual and preview it to ensure that this is the file you're looking for. Click on the Recovery button located at the top interface of the software. Choose desired location to save the recovered files that is local hard disk, Burn it to CD or DVD, create a virtual iso image or upload it to FTP server. Remember to enter the registration name and key that you'll be asked to enter before actually saving files to. Note: The software offers content aware analysis under full scan method to perform selective file recovery i.e., choose file types for recovery such as documents, images, videos etc. Content aware analysis will keep track of all your specific group files and list them in particular folders. You're also allowed to stop the scan at mid, if desired files were found. 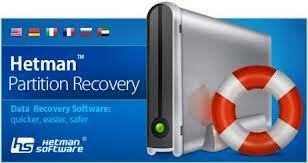 The software offers pretty different module and functionalities as compare to other recovery programs. Not Free. Saving is disabled in the demo version. To actually recover files, you need to register it which requires standard payment of $139.95. 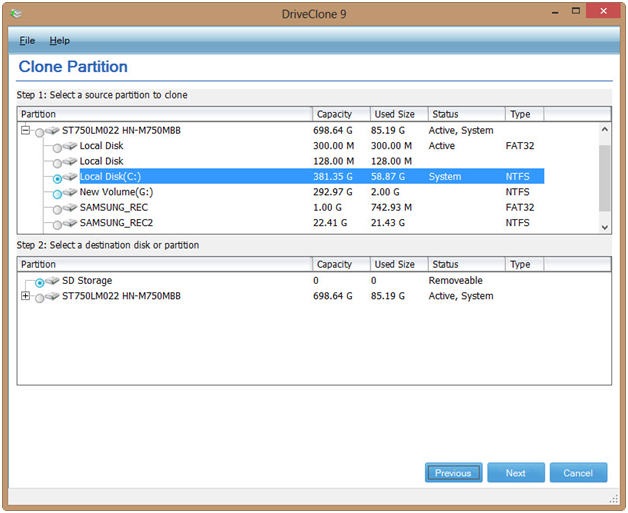 Hetman Partition recovery shouldn't be overlooked if you really want to recover your precious files. You'll have multiples scanning method to ensure that nothing were missed or overlooked during scanning procedure. Unlike other recover programs, you could stop scanning at mid if the desired deleted files were found. Just recover files from the real time scanned files list instead of waiting for hours till software scanning process is completed.